The search to find a family law attorney in California can be a daunting task. At Lawyer Legion we make that task easier by recognizing board certified attorneys (also known as "certified specialist") in our online directory. We understand the importance of specialty certification programs in family law. These programs provide a powerful tool when the public begins their search for a divorce, matrimonial or family law attorney in California. In California the board certification for family law is awarded by the State Bar of California Board of Legal Specialization ("CBLS"). Only attorneys board certified in family law can advertise or identify themselves as "certified specialists" or "board certified" in California for that field. Using a collaborative process enabling clients to resolve their issues without court intervention. This article was last updated on Saturday, October 18, 2014. The Rules Governing the State Bar of California Program for Certifying Legal Specialists govern the program requirements and should be read in conjunction with the standards for certification in Family Law. Among other requirements, the attorneys must pass the legal specialist examination, demonstrate substantial involvement in family law, and complete continuing education requirements in the specialty area. Attorneys who are certified in Family Law in California must apply for re-certification every five years after the initial certification date. Mediation and/or negotiation of family law disputes. Evidentiary hearings or trials in other practice areas. Law office management of a family law practice. Association of Certified Family Law Specialists - The ACFLS is a non-profit organization comprised of more than 550 divorce and family law attorneys in California. The only requirement to become a member of the ACFLS is that the attorney is designated as a certified specialist in Family Law by the CBLS, pays the required dues and submits an application. The ACFLS has 550 plus members with chapters for family law attorneys in the San Francisco Bay Area, Sacramento, and a provisional chapter in Orange County, California. Family Law Trial Advocacy - The National Board of Legal Specialty Certification (NBLSC) was accredited by the California Board of Legal Specialization (CBLS) to offer certification in certain areas of law including family law trial advocacy. 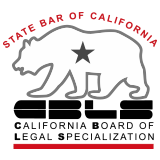 Many attorneys in California are certified as specialist by both the CBLS for family law and the NBLSC for family law trial advocacy.